There is nothing like Fall. I love it, it has always been my favorite season as i love the chill in the air, the changing of leaves, hiking, camping, and wearing Fall Fashion. 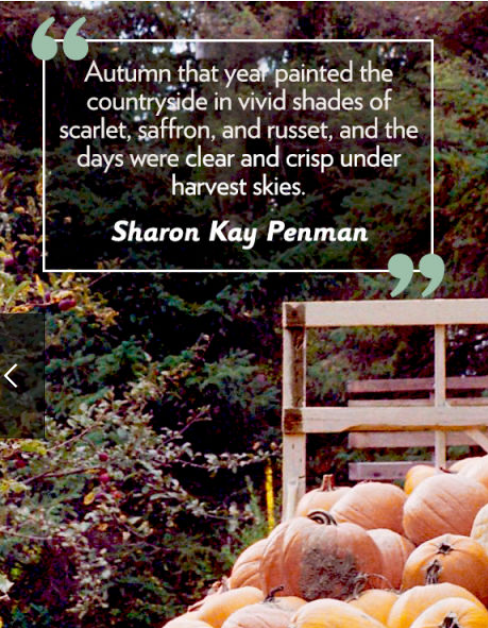 As you think of Fall and Fall hues, what colors spring to mind? I know I love most of Fall’s shades as they tend to compliment my hair and skin tone. 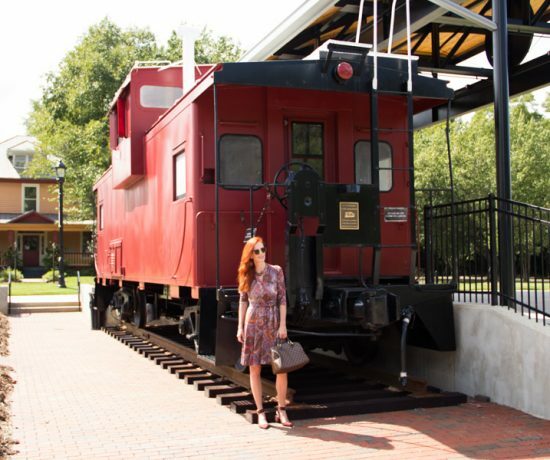 If you missed the Pantone Institute colors for this season, see my post HERE. As you might know, this is not inclusive of what colors you may love to or choose to wear over the season, they are colors that you should see in terms of what is out in stores and what designers use as their color palette. I wanted to pair several colors together today that come to mind when I see our trees in the front change color. I have collaborated today with one of my favorite companies, Uno Alla Volta. If you missed my former posts, read about them in my most recent posts HERE. When you choose accessories, are you one to buy pieces that the mass market is buying or do you look for special elements and handcrafted jewelry that has special meaning? Maybe you do both. I am fond of finding vintage pieces with meaning, as well as handmade items that are unique to themselves, original pieces. I also find pieces from artisans when i travel, as it reminds me of the places and brings back memories. Therapeutic healing. I need to keep this on at all times! 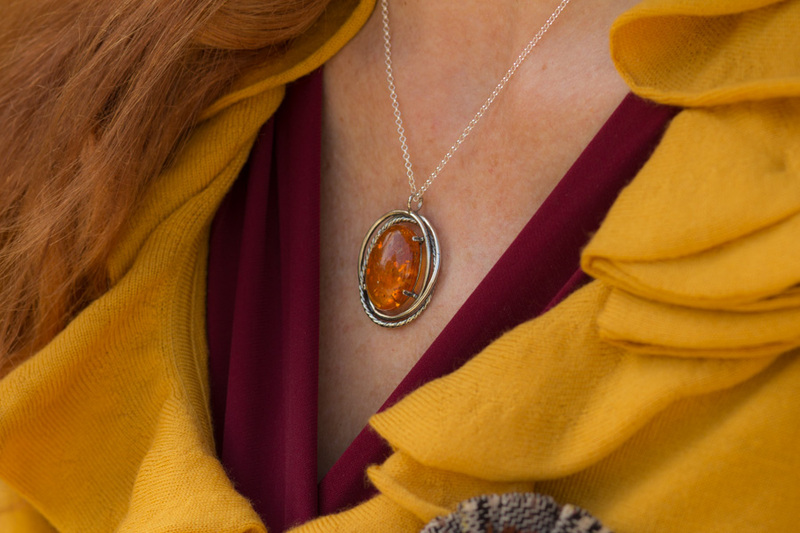 I loved the design as this necklace will go with many fall hues i will be wearing this season. 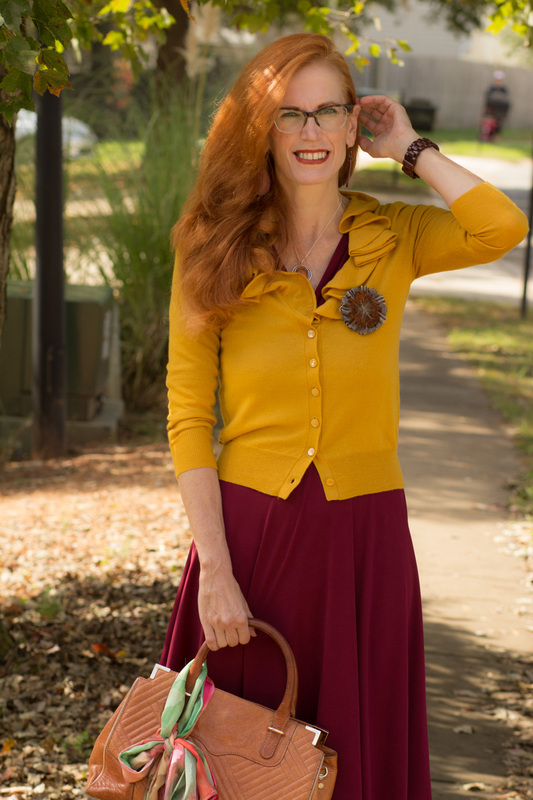 I decided to style it with other Fall colors of burgundy and mustard, wearing a vintage inspired Karina dress and adding this J Crew ruffled mustard cardigan. 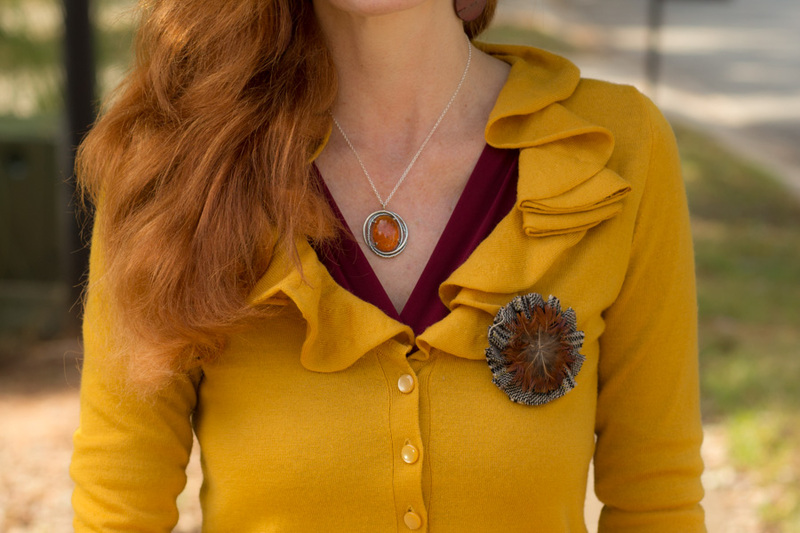 The feathered brooch adds a touch of rust and the amber necklace completes the look with added warm tones. This beautiful scarf, in its multitude of fall shades, was created by California artist, Joyita . A self taught artist, she was inspired by the times she would paint with her grandmother.” Joyita creates this wearable work of art in devore silk. After hand-painting the leaf-patterned fabric red and green with brilliant silk dyes in her California studio, she dries each scarf for 24 hours before steam-setting the glorious colors.’ This scarf reminds me of the transitional time from the green hues as the leaves change to gold and red. With the Holidays coming, Uno Alla Volta bring you items from around the world such as hand painted wine glasses, Polish pottery, jewelry, women’s accessories, hats, home decor among others. Artisans from around the world share their craft and talent with each piece made uniquely for Uno Alla Volta. 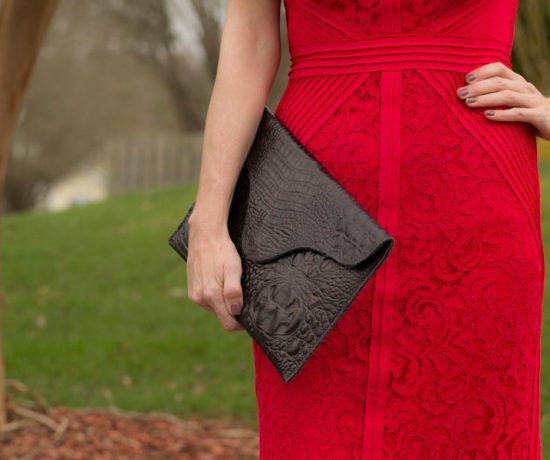 As you think about adding Fall accessories to your closet, take a look at what Uno Alla Volta offers. There are silk scarves, cozy warm ponchos and one of a kind pieces of jewelry. I love their selection of scarves, both silk and these wonderful structural scarves. Amber necklace c/o Uno Alla Volta * gifted to me. This collaboration is with Uno Alla Volta, all opinions are my own. PLEASE JOIN ME TOMORROW FOR TURNING HEADS TUESDAY. A LINKUP WHERE ANYONE CAN CLICK ON THE LARGE THUMBNAILS AND VIEW DIFFERENT BLOGS. ENJOY THE FALL FASHION. STOP BY THE BLOG TOMORROW WHERE I WILL BE TALKING ABOUT A GIVEAWAY I WILL BE HAVING ON INSTAGRAM BEGINNING TUES.
That has “Fall” written all over it. You created a really nice outfit, love the cardigan and the boots. I think you nailed the color combination. Looks awesome, well done! 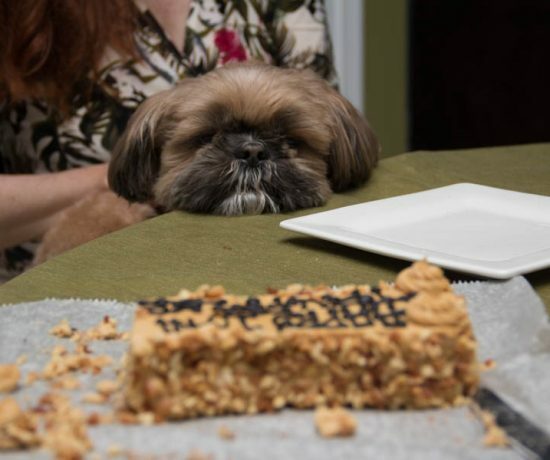 I hope you have a wonderful Thanksgiving. Such a lovely outfit Jess. I adore your cardigan, such a great colour 🙂 Thanks for sharing at Creative Mondays. You will be one of my features on tomorrows blog hop. Hope you can join us tomorrow. Your one of today’s features Jess. Pinned, and shared on Facebook and Twitter 🙂 Thanks for linking up. Thank you for joining the Top of the World Style linkup party. Great styling of the necklace and scarf! 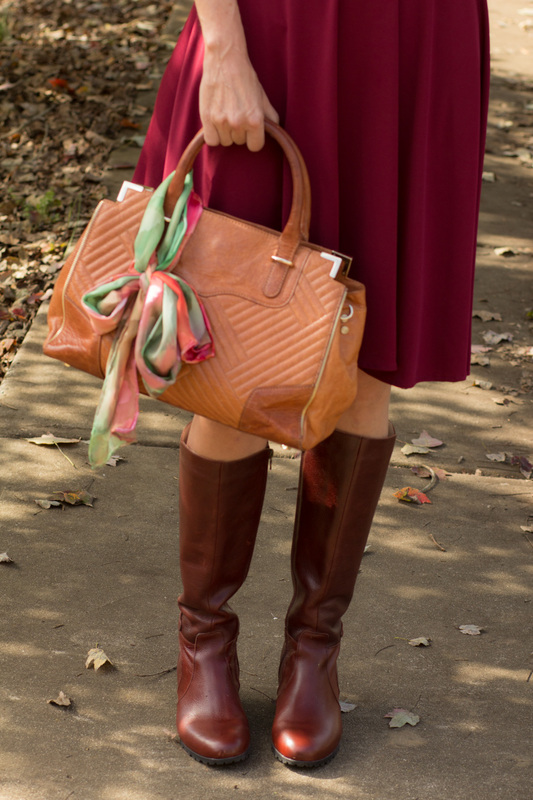 This is such a pretty Fall combo! Thanks for linking up! Definitely the perfect shades for fall! I love the dress and cardi! You totally rock the colors of fall! I love the mustard top you are wearing! 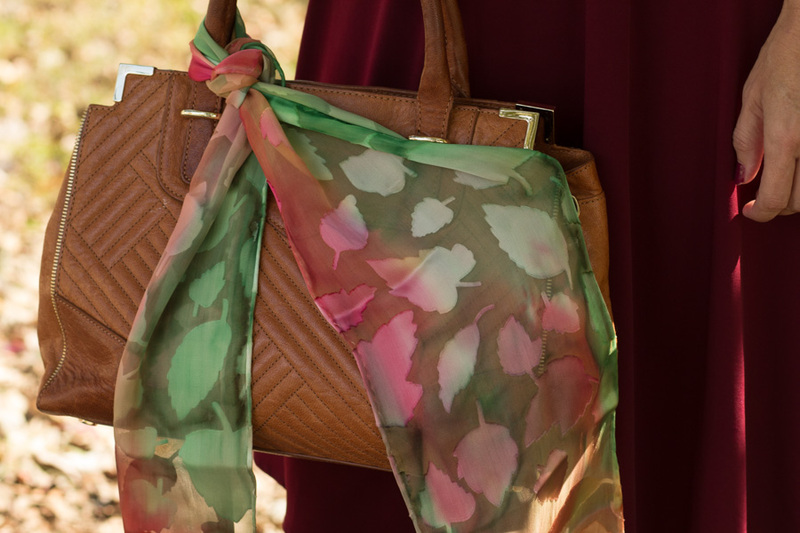 Pairing your purse with a scarf really adds a cute flair to the look. This is such a perfect Autumn outfit. Hi Sheree, Fall is my favorite season for colors. I love the cozy dressing as well. thanks very much! Gorgeous colors. They look beautiful w/ your hair. These colours are so beautiful together! I love the amber necklace and your brooch. I have a few pieces of amber jewellery – some I made myself. I should wear them more often. Very pretty scarf! Thanks for linking up jess! I will wear some of my creations on the blog soon! What a great color combo. Definitely the epitome of fall! These colors look so lovely together! At first I thought emerald green was your color but golden mustard looks gorgeous on you too! Oh, you just reminded me that I need to get out my amber!! You look beautiful. I love your entire outfit! The length of the skirt and boots are just perfect for you, you’re rocking them! I love the purse! Jess everything that you wear looks great on you. I look at all of your photos and all of the colors you wear are so pretty and suit you so well. You are so pretty with that hair , clothes and jewelry. You sure know how to pick the perfect handbags too. Have a great day my friend. Jess…this entire outfit is so lovely!! The accessories really work perfectly! !